Calcium is the most abundant mineral in the human body – it is required to build strong bones and teeth, regulate muscle contractions (including heartbeat) and to enable our blood to clot. In addition, calcium is believed to help lower blood pressure and prevent both colon and breast cancer. A lack of calcium can lead to rickets in children or osteoporosis (a progressive bone disease) later in life. According to the Vegan Society, a study of almost 35,000 UK adults revealed that vegans had a higher risk of bone fracture as a result of their lower calcium intake. Yet although adults do require around 700mg of calcium each day, contrary to popular belief we needn’t consume large amounts of milk, cheese and other dairy products in order to obtain it. Indeed, green leafy vegetables such as broccoli, cabbage and kale and South American superfood, chia seeds, are all excellent alternative sources of calcium for vegans or anyone else who is concerned about their calcium intake. Chia seeds – more precious than gold! Recent research on more than 60,000 elderly women in Sweden demonstrated that those who had a low intake of dietary calcium (less than 700 mg) were more at risk of bone fracture and osteoporosis, than those who didn’t. Chia seeds contain a whopping 500% more calcium than fresh milk and just one tablespoon of this wholesome superfood provides around 10% of our recommended daily intake of calcium! Yet calcium alone is not enough to guarantee optimum bone health. Without a sufficient intake of boron and magnesium for example, calcium will simply pass through our bodies without being absorbed. Happily chia seeds also contain both of these trace minerals (chia seeds boast 1400% more magnesium than broccoli) in addition to omega-3 fatty acids, which make it easier for our body to absorb vitamin D – another crucial component in teeth and bone heath. 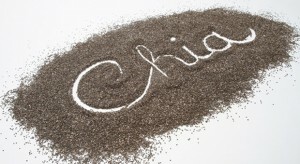 Organic chia seeds are readily absorbable and unlike linseeds, don’t need to be ground before they can be digested. This means that chia seeds, which also possess an exceptionally long shelf life, can be sprinkled straight from the bag onto cereals, salads, soups and sauces or stirred directly into your favourite smoothies, shakes, protein drinks and juices. And, when mixed with water, chia seeds transform into a lovely gel that makes the perfect base for raw desserts and biscuits and can be used to thicken tea. The post Chia seeds for stronger teeth and bones appeared first on Superfood blog - Healthy, Rawfood Lifestyle.